Previewing the new design language of Mercedes-Benz is the F800 Style, a concept car thats also thought to preview a future baby CLS four-door coupe as well as the automakers future powertrain technology. The F800 concept introduces two new technologies that will doubtless appear in upcoming models. 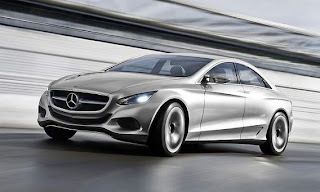 Distronic Plus Traffic Jam Assistant is an enhanced version of Mercedes' active cruise control system, which can now steer the car through curves as long as it's traveling under 25 mph. Neat. Also new is the Pre-Safe 360-degree system, which expands the existing Pre-Safe collision detection/mitigation system to the rear of the car. Now, if Pre-Safe senses that a rear-end impact is imminent, it'll apply the brakes in a bid to keep the car from getting into an additional chain-reaction accident involving other cars or pedestrians.